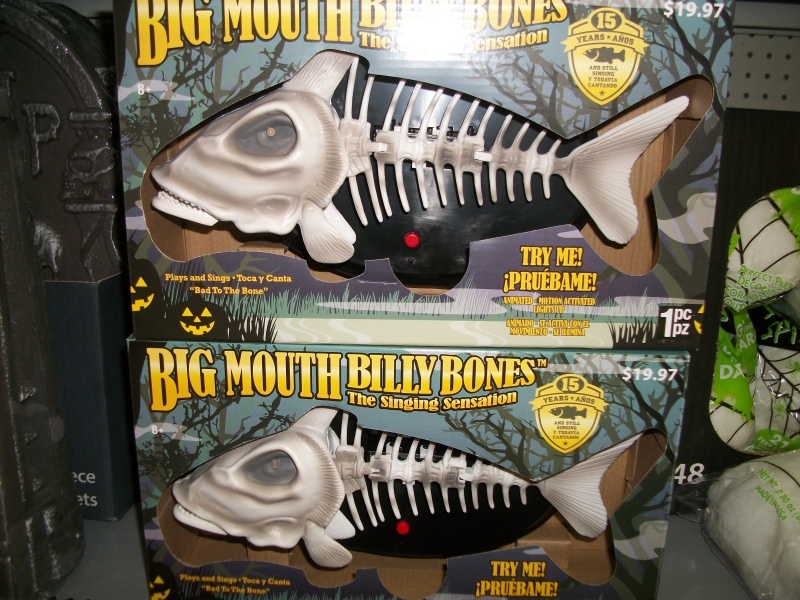 I honestly thought Big Mouth Billy's Nefarious Lich-form would be the only Wal-Mart highlight to talk about this year, but that was before I took my yearly trip to Bel Air, Maryland, only to discover that the Wallies where I grew up have an expanded Halloween selection compared to those in Iowa. 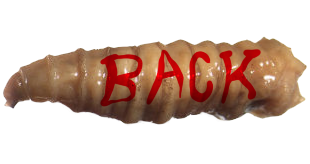 Not a massive one, no, but Wal-Mart's highlights this year are instant classics for the Halloween ages, and one may very well be the darkest, most frightening Halloween item I've found in years. We'll work our way up to it. Holy crap, can it be?! 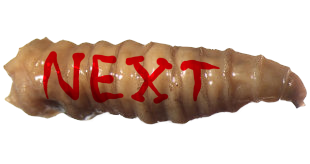 Many of my all-time favorite Halloween items have been squeaky, rubber pet toys, which tend to be a whole lot more stylish and weird than the things meant for strictly human interaction, but it's been years, since I've actually run across radically new and outstanding examples. Was it worth the wait? They're not as outlandishly freaky as the vo-toys mummy men, the spook or the galactic brain, but these guys are definitely up there. 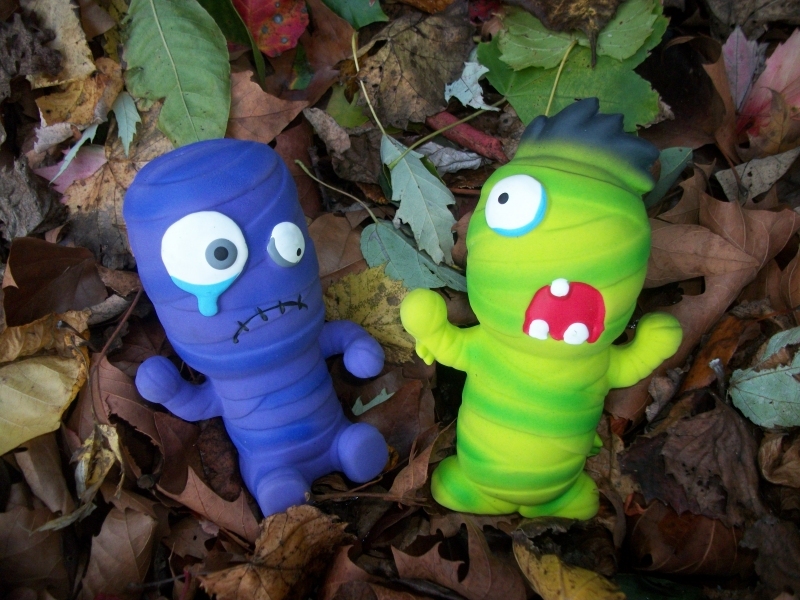 I bought the only two left on the rack, so I have no idea if there were any additional styles, but we've got a purple mummy inexplicably crying and a green, one-eyed mummy with a toothed, howling little mouth. These little weirdos just stand out so nicely, colorful and cartoonish and just ghoulish enough. With a new Star Wars movie dropping this December for absolutely definitely the first time since Return of the Jedi, the franchise is already taking over almost every facet of American capitalism, and you can buy loads of Star Wars Halloween merchandise already. Unfortunately, very little of it is designed to evoke Halloween in any direct way - you've got Yoda holding a trick or treat bag and Darth Vader presenting a candy bowl, but that's basically all there is to them. Why not a ghost Darth Vader? Why not a skeleton Yoda? I would love to know what Yoda's skeleton looks like. Wouldn't everybody? 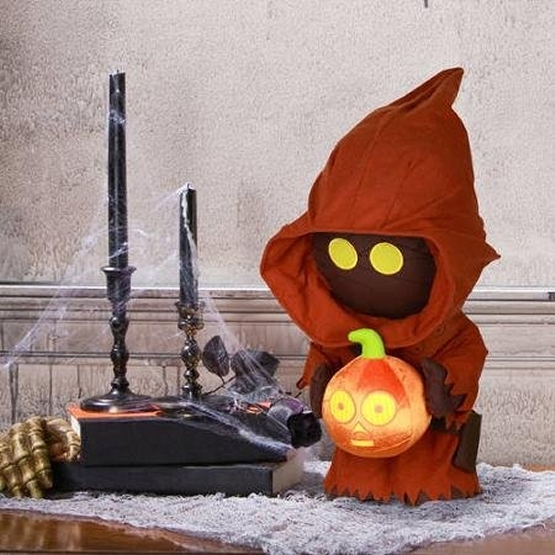 Fortunately, Jawas are already extremely seasonal-looking by default, and this cutie pie is holding a pumpkin carved to look like Threepio. I suppose it really couldn't get more "Star Wars Halloween" than this. Did you know that in early drafts, Jawa faces were invisible because they were smelled so bad they were constantly covered in flies??? These totally look like the skeletons of the "troll face," right? It's not just me? You know the one? 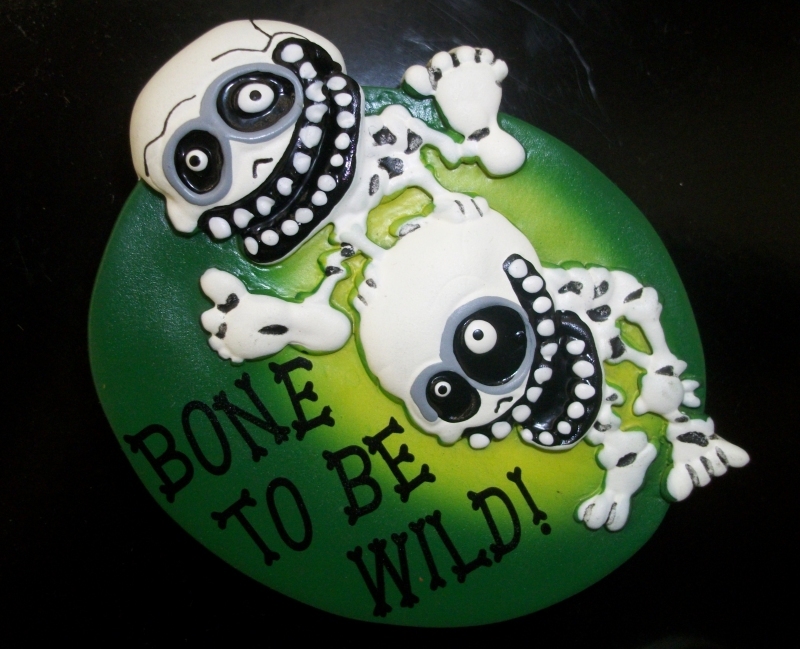 In any case, a couple of leap-frogging goblin-like skeletons, a bone pun, and a beautiful swampy green background make this $2.99 hunk of rubber a must. I've found one of these before, many years ago, but I almost wish I hadn't. I wish I could've been shocked and delighted to come upon this all over again here in 2015. 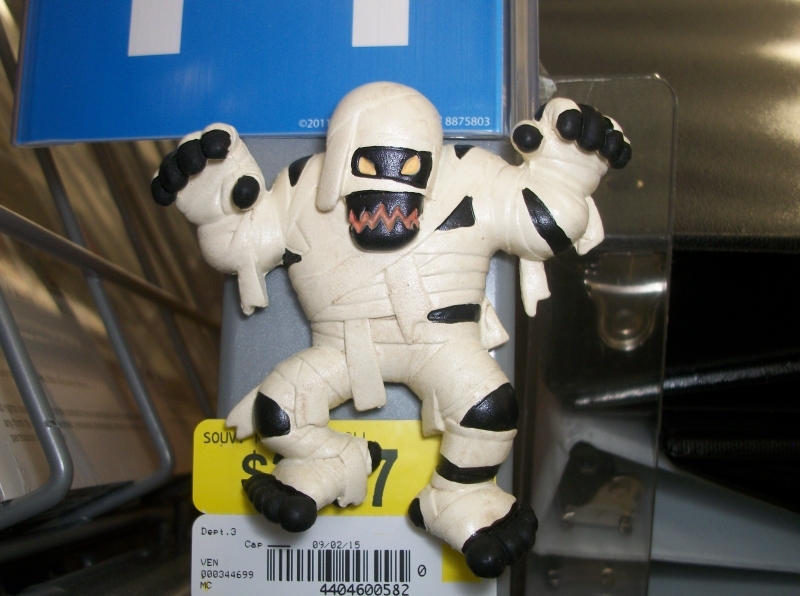 This mummy is almost exactly the late Akira Toriyama's design for the Dragon Quest series, blatantly ripped off for this set of rubber magnets that also include various other "stock" images and popular internet "cliparts" that probably weren't authorized. 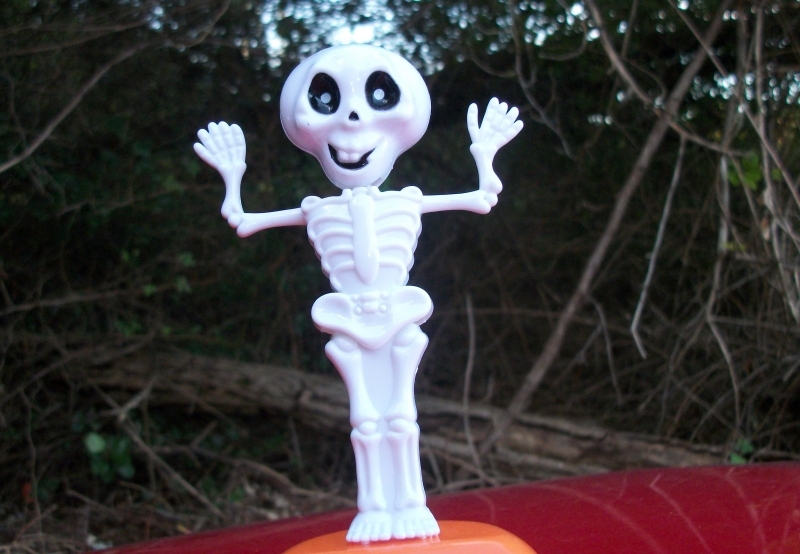 Dancing, solar powered plastic figures have become a ubiquitous novelty item in recent years, and every Halloween brings us a new slew of monsters inexplicably living it up right under the hideous rays of the sun. 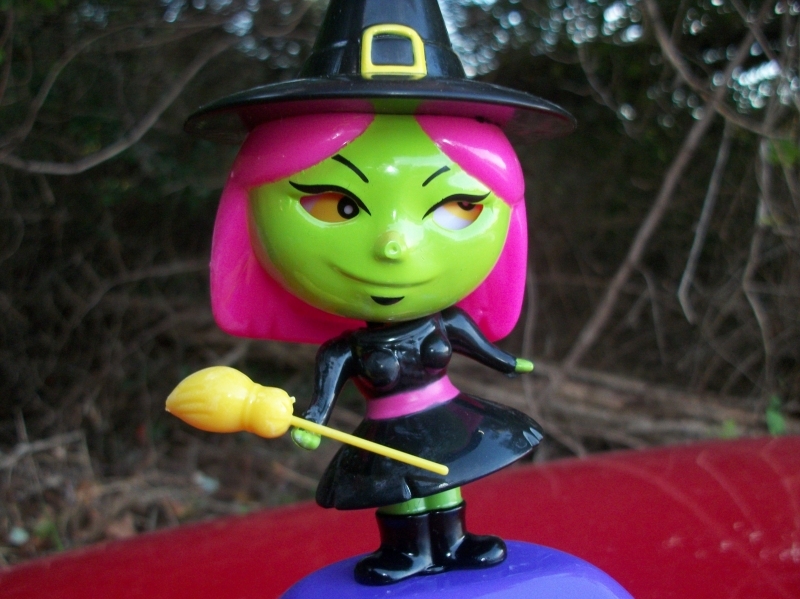 Wal Mart this year is offering four designs - sort of - and the first one I picked up was this big-headed witch. I'm a big, big fan of warty, gnarled, gnobbly, ghoulish witches, but I can also enjoy those witches that are meant to be "cute," even if both kinds are actually pretty attractive in their own ways. This one's head actually wobbles separately from an interior sphere, keeping her eyes static so they can appear to be "looking around" as she bobbles, though really she just looks fall-down drunk in every possible configuration. 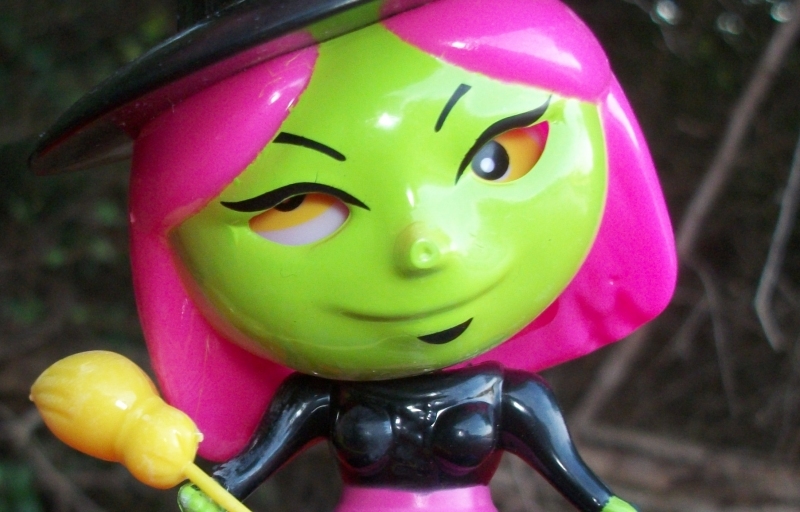 She also has painted-on shading that just looks like a snazzy goatee beard, indicating that this is actually the evil universe version of another, possibly less or possibly more evil witch, depending on how mirror universes actually function for their kind. The skeleton wobbler is probably the one to really get, much taller than the other monsters and with such a goofball face that you can already hear the bone puns just looking at him. He also, somehow, reminds me of C-3P0, not just because I was only talking about him moments ago. It's the pose, I guess. He doesn't look like he spends as much time fretting, but maybe he's a sidekick to the drunk evil universe witch. Maybe she's his Artoo, communicating in slurred, garbled expletives only he understands. My version of Star Wars would be better than any of them. Perhaps a bit more interesting is that this set of "Halloween" characters also includes, in addition to the obligatory pumpkin, a uh...smiling daisy. Packaged with all the Halloween labeling and everything. 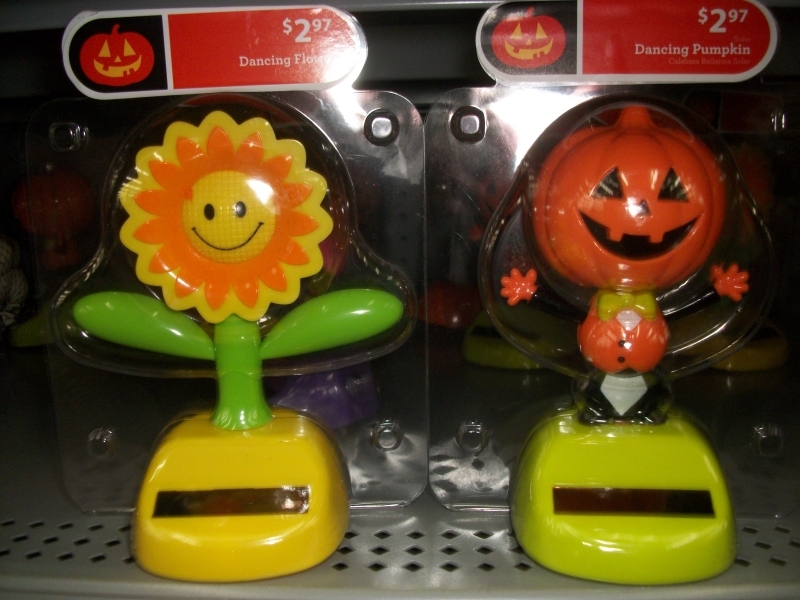 Just a mistake, or did they know we would all come to associate flowers with pure ghoulish dread this particular Halloween season? 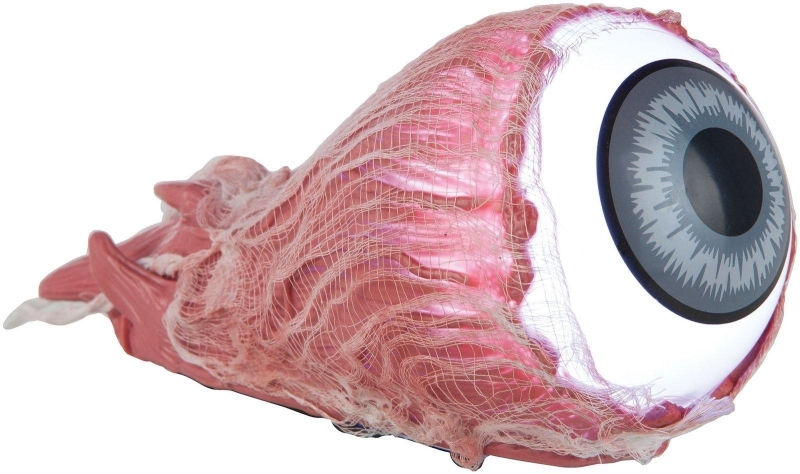 The eyeball may imitate a child's voice to lure humans to their death, perhaps consuming their souls, scavenging off their corpses, or turning their eyes into more of its own kind. The eyeball is what remains of a dead child and houses a little fragment of their soul that failed to pass on, mindlessly repeating their last words as it slithers the world aimlessly. The eyeball is a failed attempt to instantly create human life, perhaps via alchemy, feeling perpetually lost, afraid and confused in its abnormal vessel. The eyeball is all someone was able to retieve in an attempt to bring their child back from the dead, now trapped in eternal unlife and forever begging to be extinguished. The eyeball is a human trapped in this pathetic form as punishment for having seen something forbidden to mortal eyes...or just peeping on a warlock in the shower. Perhaps the creepiest part of all is how this is a bump and go novelty, meaning it changes direction only when it hits something. Ergo, this severed, crying eyeball can't even actually see.